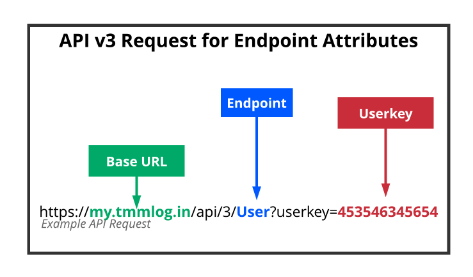 TMMData Foundation Platform API v3: Searching for a Specific Endpoint ID. This article is a continuation of the article: API v3 Search Request Overview. This article outlines the process in which one may use the API v3 Search Request to receive the ID of a desired Endpoint by configuring the filter array. This document also covers how to determine what attributes are available to filter against on a given Endpoint. Determine which Endpoint that should be searched against. Request list of attributes available to selected Endpoint. Endpoint: The Endpoint represents the object, or collection of objects, that the request is intended to interact with. In the above example, the Endpoint in the 'Example API Request' is 'User'. This will cause the system to only return attributes relating to 'User' data objects. Executing API v3 Request and the response received. The attributes that can be used to search against can be found within the JSON response object -> "data" -> "attributes". In this example, using the User Endpoint, the attributes are as follows: user_id, user_guid, fname, mname, lname, email, phone, user_type_id, cust_id, adobe_key, login, last_active, is_active, exceptions, notes, two_factor, auth_token, expires, password_history, access_type, notification_preference, primary_id, primary_guid. Any or all of these attributes may be used in a Filter Array to zero in on a specific Endpoint ID. We have now acquired all of the information needed to create our Search Action, including the Filter Array containing all of the attributes and values representing the desired Endpoint ID. This Action, [ &action=search ], configures the system to accept a Filter Array that will determine the search parameters. Note that the Action is prepended by an ampersand (&), all variables following the first are prepended with an ampersand. We've found it! The Endpoint ID that we were looking for is 17. Now any API v3 Request we make that would affect this User would contain this ID.